Initially, this article was primarily written for real estate professionals engaged in short sales. Since that time, many other folks have found this information of benefit so they can learn what must be done to get a fresh start. With this in mind, let’s begin with a review of Zombie Mortgages. In the words of a Realtor® friend who recently summarized my article to a group of Independent Realtors® thusly: These are mortgage which had a Promissory Note that was discharged (extinguished) in a Chapter 7 Bankruptcy but which remains secured by the Deed of Trust that is secured to the property. We first discussed this phenomenon in a 2010 article titled Living Underwater After Bankruptcy. The bottom line is the Debtor(s) elected to voluntarily retain and pay the first mortgage and occasionally the second mortgage while discharging the promissory note(s) in bankruptcy. One – Don’t blame the lawyers. They were doing their job and in the vast majority of cases they did their job very well. Two – The attorney has concluded their professional work for this debtor and in most, if not all, cases is no longer representing your prospective short sale client. Three – Don’t let selective memory regarding the minutiae of the discharged note(s) interfere with your goal of extinguishing the deed(s) of trust. Four – Don’t ask for or expect a mortgage reaffirmation so as to benefit the short sale. It may not be legally permissable and is unnecessary. Five – Be wary of engaging in the unauthorized practice of law and understand you may have to work harder and smarter. Six – There are situations that may require the attorney’s help, make nice. Read on to be aware. In this situation, debtors select to pay only the first mortgage payments and make no payments on the second mortgage. In cases where the second mortgage has little or no secured value above the first mortgage, the second mortgage holder may make a financial decision to not to enforce the trust deed and foreclose. The result is that the property continues to be encumbered by the second mortgage deed. Short of foreclosure, the property may not be sold without obtaining a release of the Deed of Trust from the second mortgage holder. There are many factors that can complicate getting a short sale accomplished. This situation is exacerbated in instances when the second mortgage was sold, assigned or otherwise is made difficult to trace. Due to the fact is that it has been many months and sometimes a few years since the debtor made a payment on the second mortgage and has no contact information. This make getting a short sale finished even more complicated than a short sale where all of the actors can be readily identified. It can be an obstacle just finding the second mortgage loan number. This is often exacerbated by the fact the debtor no longer receives payment notices and/or does not recall to whom payments were made. Here are a few thoughts on where to find this information. 1] Check the tax return for the last year mortgage payments were paid, the 1098 issued by the lender will contain the loan number. If that named servicer is no longer around, do a Google search to determine the likely holder today. 2] Order an O & E from your title insurance company. Include the debtors name and social security number search in your request – the original loan number will be on the Deed of Trust along with the original lender. And you might get lucky and find a recorded assignment of the Deed of Trust if the mortgage has changed hands. 4] Go online to the Mortgage Electronic Registration System (MERS) and click the link to find the servicer. Oops, all in order for the short sale except you have learned the bankruptcy is still open. How can the case be open? Good question, however the reason is beside the point as you may still accomplish a short sale. What is needed at this juncture is for the Trustee to agree to a Motion To Abandon Interest of the real estate so the short sale transaction may proceed. This is where you need the attorney to help you. Your client should be prepared to pay for the legal professional time for preparation, filing and prosecution of the Motion. It is not infrequent that judgment liens will appear to be attached to the title in spite of the bankruptcy discharge. It is also not infrequent that many title insurance companies will insist the discharged judgment must be removed. TIP: It is not all that difficult to find a title insurance company which understands bankruptcy law and will insure over the phantom, impotent judgment. Contact me if you need help finding such a title company in Colorado (only). It has come to our attention time and time again that many believe a Chapter 7 Bankruptcy Discharge extinguishes both the Promissory Note and the Deed of Trust (TD). This is not true. In Colorado, the TD remains attached to the real estate for fifteen years after the date on which the final payment is due. To illustrate, on a typical second mortgage, the final payment is due fifteen years after the loan was originated. In the instance referenced in this blog, the TD would be extinguished thirty years after the origination date. On this, in order to be assured of the law as it pertains to your specific situation, contact a Real Estate attorney about C.R.S 38-39-201. What If the FHA or VA Mortgage Servicer Refuses To Participate? You can vote and you can call your congressman if an FHA/VA servicer refuses to participate in a legitimate short sale. I recently had occation to advise a Realtor friend to direct his client to contact the district liaison with her congressman’s office. It took just three weeks for the servicer to reverse their position and agree to engage in good faith negotiations for a short sale. An FHA or VA servicer must abide by their contractual obligation to help FHA or VA minimize losses. This means that if a short sale makes economic sense they are obligated to deal in good faith. If one refuses that’s when your client may wish to reach out for congressional help. Click here to find the appropriate congressional office. Who does the short sale benefit? Is it the seller? Is it the lender? Is this the short sale of a property on which the lender or lenders will not foreclose, such as a unit within a type of condominium complex? Is this a short sale merely for the benefit of a real estate sale commission? What is the Tangible Net Benefit of shot sale of the short seller? 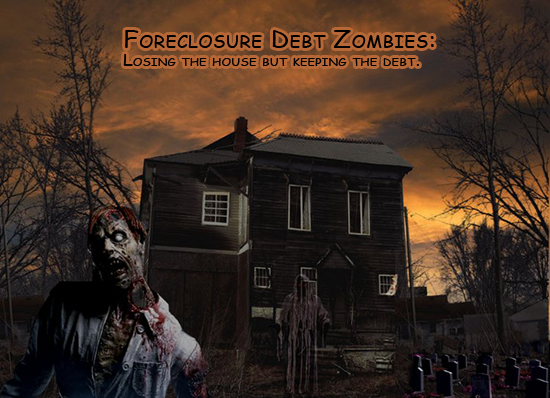 Finally, given there is limited compensation available for the zombie second there are times when the holder of this second deed of trust simply will not cooperate with a short sale. The bottom line is the potential 10% financial settlement the first mortgage holder will pay the second mortgage to release their trust deed is not a sufficient financial incentive. This entry was posted in Attorney, Bankruptcy, Bankruptcy Lawyer, Bankruptcy Refinance, Chapter 13, Chapter 7, Credit Scores, Deed in lieu of foreclosure, FICO, FICO Pro, FICO Scores, HAFA, http://jimspray.brandyourself.com/, James Spray, James Spray CCMB, Jim Spray, Mortgage Help, Real Estate Lawyer, Shadow Inventory, short sale, Stripping 2nd Mortgage, Uncategorized, Zombie Mortgage and tagged Foreclosure, http://jimspray.brandyourself.com/, Inherited Credit, Short Sale. Great discussion of the topic with usefull facts for all Real Estate practitioners. There are zombie seconds littered throughout the short sale landscape.